As a follow up to our article on ways to use duck fat, here’s how we use duck bacon. We love duck bacon. It has a wonderful flavor and is actually much leaner than pork bacon. It also leaves a less pervasive aroma to cling to our apartment’s air. Treat yourself to some. It also makes a nice gift for people who like to cook and enjoy pork bacon or roast duck. Duck bacon is sold by D’Artagnan in eight-ounce packages for $14.99, with a price break for a six-pack. Unopened packages can be kept in the fridge for eight weeks, or frozen. 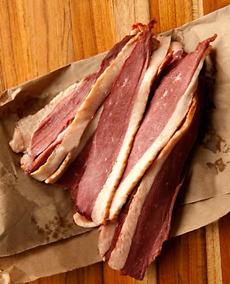 Duck bacon is thinly sliced smoked duck breast, made from Moulard duck breast (called magret de canard on menus and in recipes—see the different types of ducks). The breast is rubbed with salt and sugar, smoked over applewood and thinly sliced into strips. The bacon is fully cooked during smoking, and only needs to be tossed into a hot pan and fried until crisp. The slices are somewhat smaller than pork bacon strips, but they are thick and meaty with a rich, smoky flavor. All-natural duck bacon comes from humanely-raised ducks. The product is labeled “uncured” per the USDA, because it has no added nitrates or nitrites. Duck bacon is delicious in any recipe that calls for regular bacon. Serve with eggs or the pancake-waffle-French toast group. Add to sandwiches (our favorite is this Foie Gras Club Sandwich (recipe). Use in quiche and other savory tarts/pies. Make luxury burgers or sliders: Wagyu beef, foie gras and duck bacon. Add to Brussels sprouts and green beans recipes. Serve with fish and seafood: scallops, shrimp and lobster. Enhance any poultry or meat recipe. 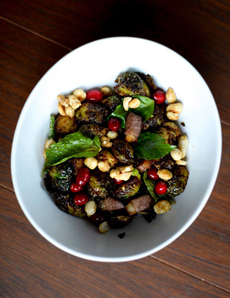 Crispy Brussels sprouts with duck bacon at Distilled NY. And save the rendered duck bacon fat to sauté potatoes or vegetables. According to the Food Standards of the USDA, the term “bacon” designates the cured belly of a swine carcass. If meat from another portion of the carcass is used, the product name must be qualified to identify the portion—for example, pork shoulder bacon. And if another animal is used instead of the swine? But according to the USDA, it isn’t. Unless it’s from a pig, it’s “imitation bacon” and should be labeled as such. Alternatively, it can be called “crispy smoked duck strips” or any word other than bacon. Come on, USDA, change those standards. Your way is much more confusing to the consumers you’re supposed to be protecting.